A podcast breaking down Titanic minute by minute and WE'LL NEVER LET GO! See the full archives for Sinking Feeling, a weekly digest of links and information from the podcast. Sent by our archiver, Caroline. Join Titanic Minute Steerage, our Facebook group of listeners. Wait, so what is this all about? 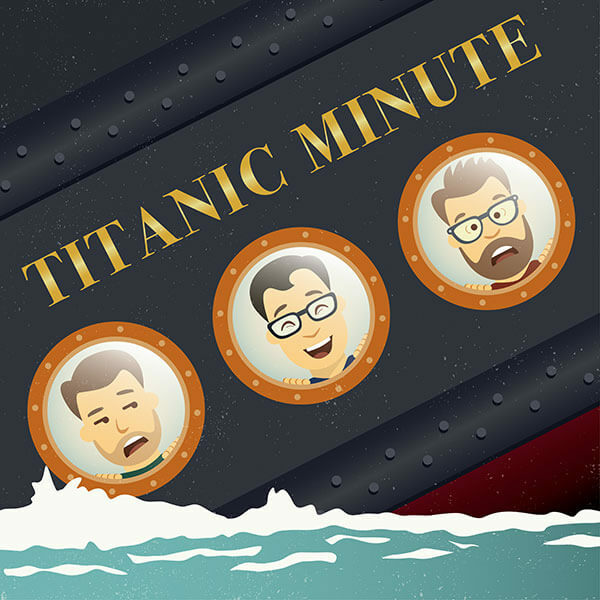 We’re going through the movie Titanic minute by minute and doing a podcast episode for every single minute. Whether you love it or hate it, everyone knows Titanic, and there’s no shortage of topics about it and the sinking. We have to give all credit to Star Wars Minute for inspiring this crazy idea that also inspired a whole bunch of other MxM podcasts. Who are the Midnight Boys? A nickname for the hosts. Rob and Joe previously hosted Tombstone Minute, and Duff was an occasional guest host. During college, we would stay up until all hours of the morning watching movies. This led to Rob’s girlfriend (now wife) dubbing us the Midnight Boys. Where can I watch Titanic? Is it streaming? Titanic is currently unavailable to stream, but it airs fairly often on cable. You can also buy or rent it from most major video services. Joe is a respected educator. Rob is a guy that builds websites. Duff is a public servant/moocher. We attended UW-Madison together some 15 years ago and decided there aren’t enough podcasts of guys dissecting mainstream entertainment. I like that jaunty theme music. Where can I stream it? Our theme music is "The Sea Wolf" by Flash Girls and licensed under Creative Commons BY 4.0. You can stream or download it at archive.org. Cool cover art. Who made it? That is all the work of Alina Ruppel. She does good work. You can use the audio from our website or subscribe via iTunes, Google Play or any podcast service that uses XML. Follow us on Facebook and Twitter or join the listener's society, Titanic Minute Steerage. Listen to our previous podcast, Tombstone Minute, or buy Titanic Minute merchandise from TeePublic. © Copyright 2018 Titanic Minute. All rights reserved.